Saint Catherine of Sienna Perpetual Adortion Chapel! Our Perpetual Adoration Chapel is open for faithful adorers 24 hours a day, 365 days a year with some exceptions due to special holy days, celebrations or severe inclement weather. The Real Presence of Christ is in exposition throughout Perpetual Adoration; the Blessed Sacrament is held in a monstrance for all to view. All Adorers maintain proper reverence and respect for Our Lord while in His Presence throughout the exposition of the Blessed Sacrament. All are welcome to spend time with Jesus Christ in silent prayer. Most often there is silent prayer by those in attendance; however, at times there can be guided meditation and prayer. 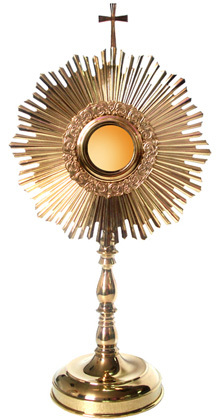 We have an active Adoration Ministry and our volunteer Adoration Ministry Captains provide leadership to ensure there are two or more Regular Adorers, also known as guardians, in the Real Presence of Christ throughout Eucharistic Adoration and Exposition during the day and throughout the night. Our Parish on special occasions may have Adoration of the Blessed Sacrament in our Church, at our Saint Catherine of Sienna Chapel in the Sienna Center or in the Holy Family Prayer Room on Lower Level of Sienna Center and may include Benediction, more formal public prayers, scripture readings, songs and blessing.